The above graph is from a new study published in the journal Nature. It found that at the same time that global warming has appeared to pause -- as shown in that highlighted section of global-mean temperature -- the Pacific Ocean has had unnaturally cool surface temperatures. The cooling is part of a natural cycle, and the researchers, from the Scripps Institution of Oceanography, say that it accounts for most of the slowdown in rising global surface temperatures. This isn’t the first localized climate-related event to have effects on the progression of climate change as a whole. Last week, other researchers determined that in 2010 and 2011, massive floods in Australia slowed down the global rise in sea level that would have been been expected from observed rates of glacier melting and the thermal expansion of sea water. In many cases, it seems, the subtle and complex dynamics of the planet’s climate systems can camouflage the background trend of warming, caused by human activity. 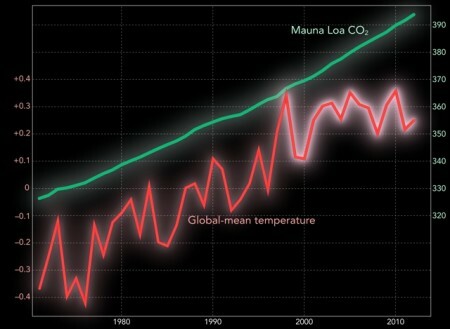 But that trend is continuing regardless, and so the most obvious impact of this new finding is a disconcerting one: the Pacific will eventually return to normal temperatures, and as a result, global warming will continue. The scientists don’t know exactly when this will happen, but records indicate that the Pacific goes through this longer-term cycle every decade or so, meaning that the era of an abnormally-cool Pacific will probably soon be over. Climate Central has more information that puts the study into context with what we already know about this trend. It all suggests that we might as well enjoy the pause for now, because it's likely not an accurate representation of what's to come.